Delta alumni may have already received the first round of postcards pictured below or a related email. 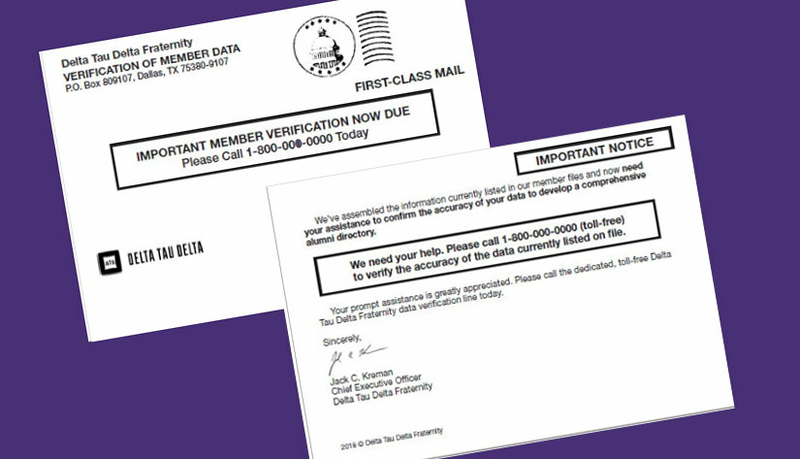 During the next few months, you will receive a combination of postcards, emails and phone calls from Publishing Concepts (PCI) as The Fraternity has contracted with them to help verify alumni data and publish an alumni directory that is as up-to-date as possible. We understand alumni might not want to provide information to just anyone, so please know their request is legitimate and sanctioned by Delta Tau Delta. We are not asking for vital private information or protected financial information. This project is important because it allows the Fraternity to update its membership database and ensures alumni have the ability to stay connected with chapter brothers. Alumni will have the opportunity to purchase an alumni directory, merchandise that proudly displays our logo. When you call to update your information you will be asked if you would like to purchase a copy of the directory. Reconnect with chapter brothers and make valuable social and professional connections. Access to Fraternity alumni services. Engage with the Fraternity through our products and services. Questions? Read the FAQ page.